From ornate ship figureheads and ancient stone statues to colorful parade floats and temple ceilings, Japanese dragon art honors these mystical creatures of protection, strength and good luck. This replica of the figurehead of the S.S. Empress of Japan overlooks the water in British Columbia's Stanley Park. The original figurehead guarded the vessel from 1891-1926 through its years as a cruise ship and armed merchant ship during World War I. The serpent-like dragon mounted on the ship's bow is one of the four divine beasts of Japanese mythology. The guardian of a park, this beautiful Japanese iron dragon is a wonderful example of dragon art. Most Japanese dragons, known as ryu or tatsu, are heavily scaled, wingless, horned mythical creatures. One of the main characteristics that distinguish Japanese from Chinese dragons is their three-toed clawed feet. Multiple dragons guard the spirit of Leyasu at the Toshogu Shirne in Nikko, Japan. Leyasu was the founder of the military dynasty, the Tokugawa Shogunate, who ruled Japan form 1603 to 1867. Unlike most Shinto shrines that are built to blend into its surroundings, Toshogo is colorful and extremely ornate. This exquisite fiery red Japanese dragon is located on the inside of a paper lantern. Most Japanese temples and shrines have a dragon sculpture at the entrance, known as a chozu-dokoro. Water flows from the mouth of the dragon allowing worshipers to cleanse and purify their hands and mouth before entering the temple to worship Buddha and the Gods. A beautifully detailed golden Japanese dragon is a perfect example of the many dragons that adorn parade floats. These highly revered supernatural creatures often have a place of honor in Japanese parades. An awe inspiring painting of two dragons by Koizumi Junsaku adorns the ceiling of the Kennin-ji Temple in Kyoto, Japan. The dramatic painting was added in 2002 commemorating the 800th year anniversary of the temple. Built in 1202, Kennin-ji is the oldest of the Zen Buddhist temples in Japan. A reproduction of an ancient dragon face from the Ryukyu culture located on the grounds of Shurijo Castle, Okinawa, Japan. The sculpture was rebuilt after World War II. Sitting on the roof of a Buddhist shrine in Kamakura, Japan, a fierce dragon provides protection. Japanese dragon art exemplifies the power of the dragon. 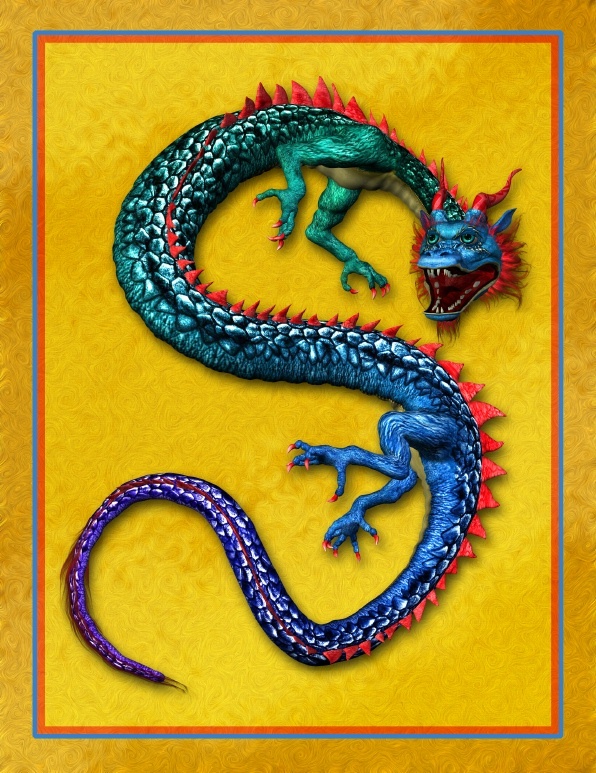 To enjoy a sideshow of Chinese Dragon artwork visit Slideshow:Dragon_Artwork.